Gov. Doug Ducey wielded his veto power this year fewer times than any governor since 2004. Rooftop solar companies that lease panels to customers shouldn’t be charged property taxes for the solar arrays, an Arizona appellate court ruled Thursday. A family of four can bring in more than $60,000 annually to be considered low income for the state’s recently expanded voucher program, allowing them to access more funds to attend private school. 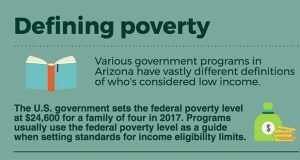 But to be considered low income for various other state programs, like ones that allow the poor to buy food or basic necessities like toilet paper, the line is much lower, meaning fewer people qualify for help. The fiscal year 2018 budget proposed a small boost in pay for Arizona teachers, allowed the state’s universities to take on more debt to construct new buildings, and instituted a performance-pay program for high-achieving schools. More than $11 million in the governor’s budget proposal would address fire alarm systems in the state’s buildings and prisons that are getting old, outdated and in various stages of failure. Gov. Doug Ducey doesn’t support efforts by one of his allies to cap pay for public school administrators and mandate a higher level of direct classroom spending. Sen. Sean Bowie, D-Phoenix, the only true freshman in the Senate, beat out a Republican in moderate Legislative District 18 last year, and his victory, he said, has helped to defeat some bad bills this year.